What do Mac folks use to edit their blogs offline? I’m amazed that after all these years, no one has come out with a killer offline blog editor for the Mac yet. It seems like there’s more development energy going towards iPhone blog editors than desktop versions. I really liked working in Windows Live Writer back when I was a fulltime Windows user. I loved that once configured, the editing window used your blog’s own style sheet so your typing appeared exactly how it would look on the blog. The problem was that the code was pure Microsoft: crap. Full of unnecessary tags and other junk that caused all sorts of problems. And I now only run Windows XP in VMWare Fusion when I absolutely have to. As I see it, if you want to use an offline editor on a Mac you only have 3 choices, each with its own strengths and overwhelming weaknesses. Ecto: This was my favorite editor for a long time. 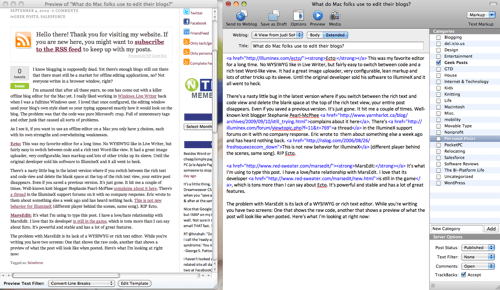 No WYSIWYG like in Live Writer, but fairly easy to switch between code and a rich text Word-like view. It had a great image uploader, very configurable, lean markup and lots of other tricks up its sleeve. Until the original developer sold his software to IllumineX and it all went to heck. There’s a nasty little bug in the latest version where if you switch between the rich text and code view and delete the blank space at the top of the rich text view, your entire post disappears. Even if you saved a previous version. It’s just gone. It hit me a couple of times. Well-known knit blogger Stephanie Pearl-McPhee complains about it here. There’s a thread in the IllumineX support forums on it with no company response. Eric wrote to them about something else a week ago and has heard nothing back. This is not new behavior for IllumineX (different player behind the scenes, same song). Yes, I can revert to a previous version. But the writing is on the wall: RIP Ecto. MarsEdit: It’s what I’m using to type this post. I have a love/hate relationship with MarsEdit. I love that its developer is still in the game, which is tons more than I can say about Ecto. It’s powerful and stable and has a lot of great features. The problem with MarsEdit is its lack of a WYSIWYG or rich text editor. While you’re writing you have two screens: An editing window that shows the raw code that you’re typing in. And another that shows a preview of what the post will look like when posted that updates as you type in the editing window. You have to set this up for yourself by copying the source of a blog entry to a template editor and then replace the title, body, etc with placeholder tags. It would be wonderful if MarsEdit had a “Get Preview” button that did this for you once it has your blog URL. I don’t mind it too much, but there are folks who are scared off by seeing code while they’re editing and would prefer the option for a cleaner view. If I want to edit the image’s size or alignment after I’ve placed it, I have to know the HTML to do it. Fine for me, not so much for my husband or colleagues. Blogo: If MarsEdit errs on the side of being too geek, Blogo goes too far in the other direction. Eric has a license, so I tried it. Ran screaming mad away from it. Pretty, but so buggy! Very difficult to edit the code it decides your blog needs. I switched to HTML to make a change that the WYSIWYG wouldn’t do correctly, switched back to WYSIWYG and Blogo wiped out my change. Thanks. Finally, I don’t need a blog editor that’s also a Twitter client. Any other options out there I should look at? I’m pretty happy with Marsedit, but I’m a long-time plain text coder (currently Textmate), so the lack of RTE doesn’t bother me. But I think you’re missing a strong 4th option: the Scribefire plug-in for Firefox. Not Mac-specific, but it does most of what this competition does just fine on a Mac and can work offline. Even if you use Safari to browse, there’s a good case for installing Firefox and Scribefire as a free and competitive alternative. Have you contacted Daniel Jalkut about your suggestions for MarsEdit yet? Seems like a reasonable request. I’m not really (uh, what do you call it, blogging?) these days, but I have an ME 1.x license and I’d probably upgrade to 2 if I was doing any high-volume work.